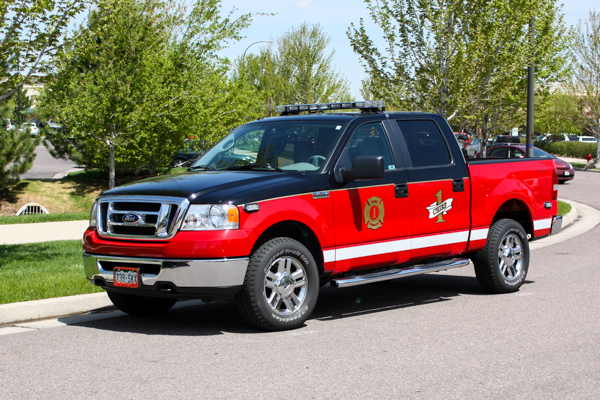 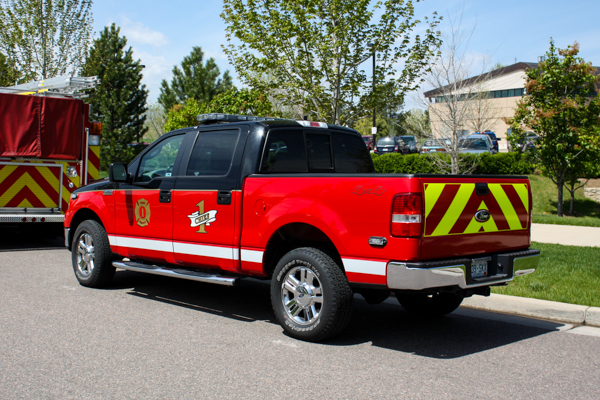 Fire Station 1 is located at 15415 Gleneagle Dr.
(Chief 1) Ford F-150 4×4 XLT Super Duty. 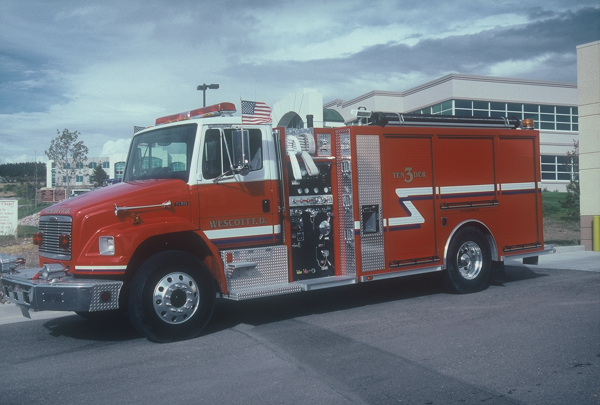 (Engine 1) Spartan Diamond / Rosenbauer / Central, also ran as Engine 510. 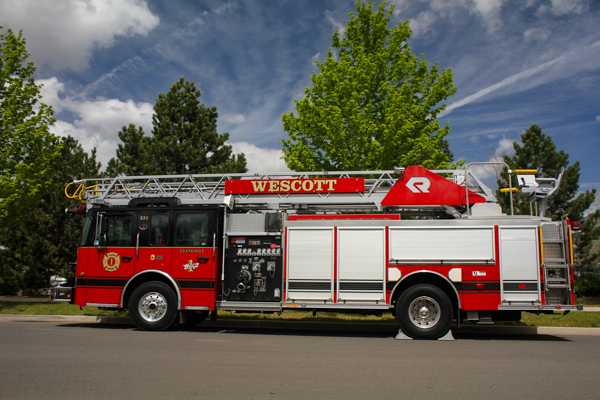 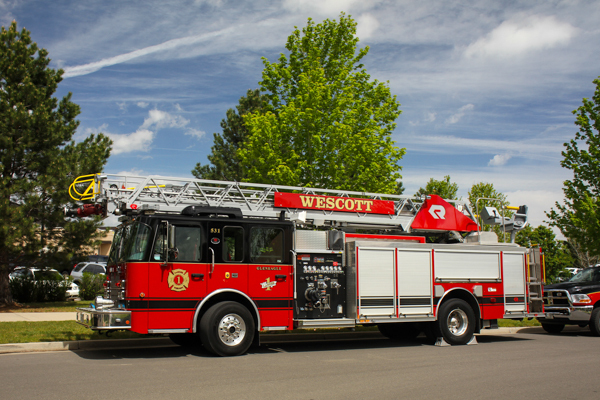 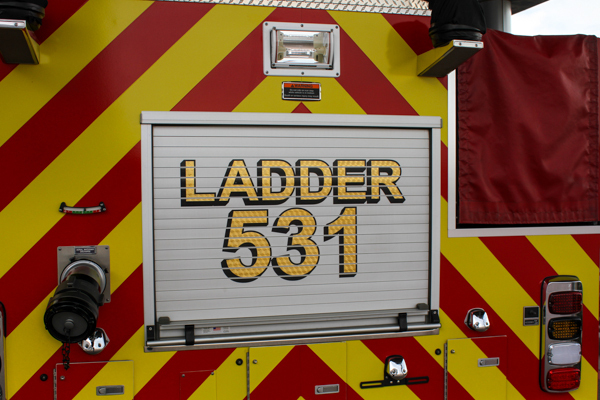 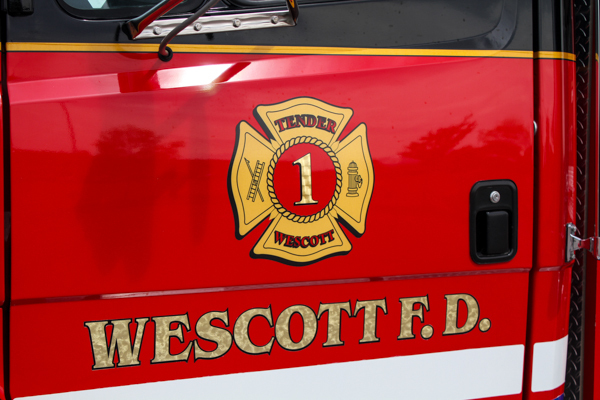 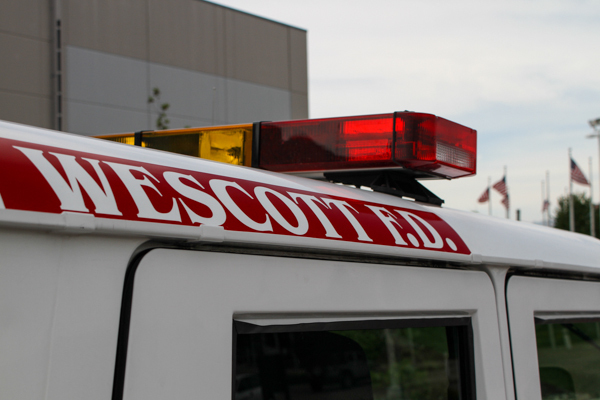 (Ladder 1) Rosenbauer / Central 75′ rear-mount aerial. 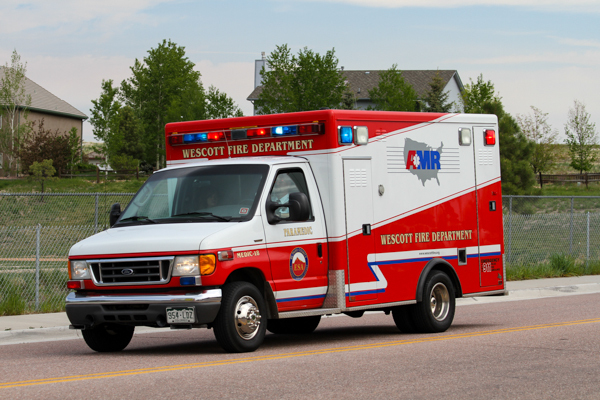 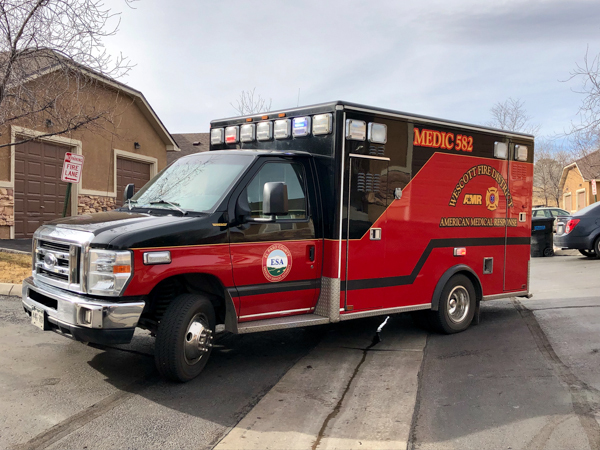 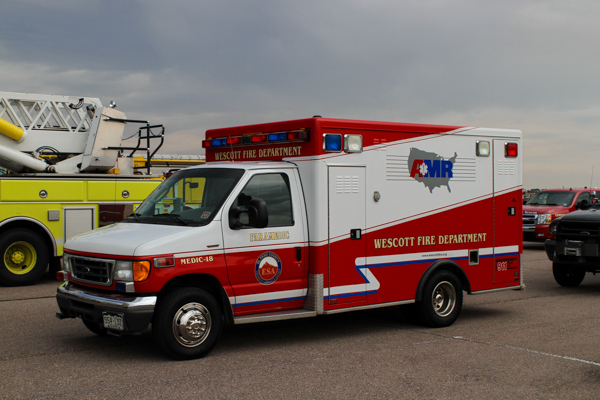 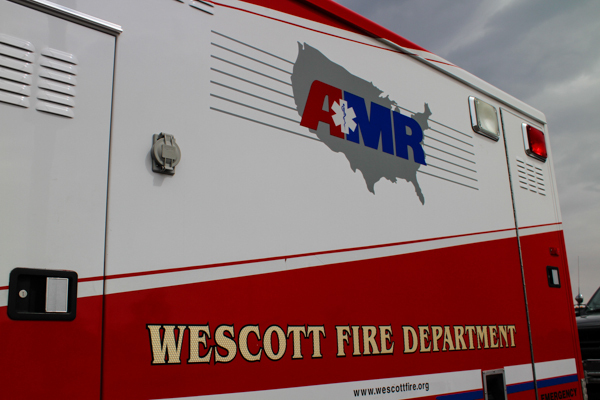 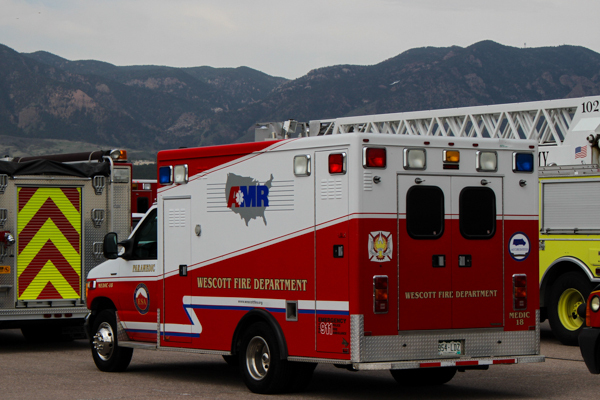 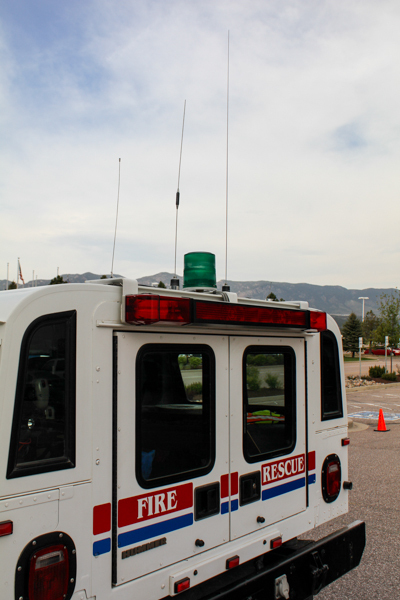 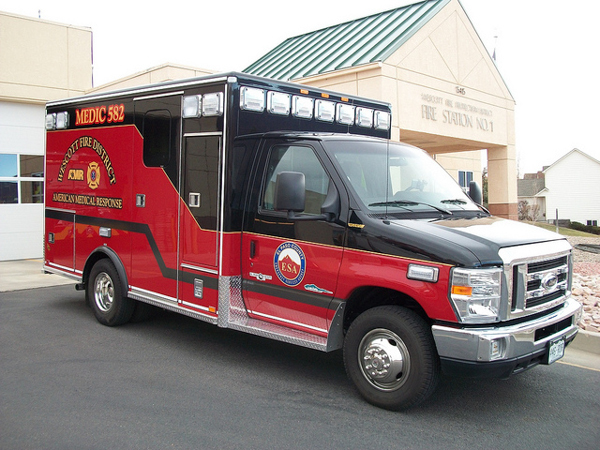 Ford / AEV, American Medical Response (AMR) Ambulance provider for all of El Paso County. 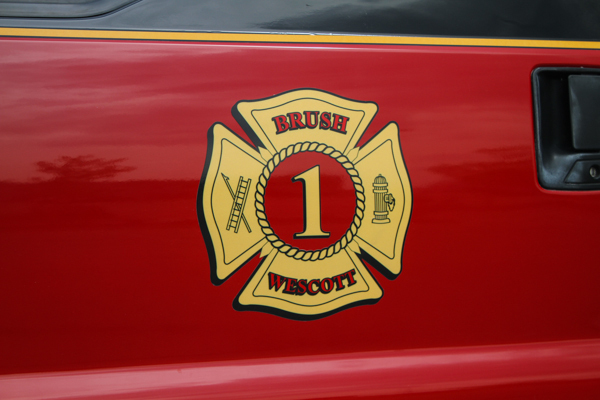 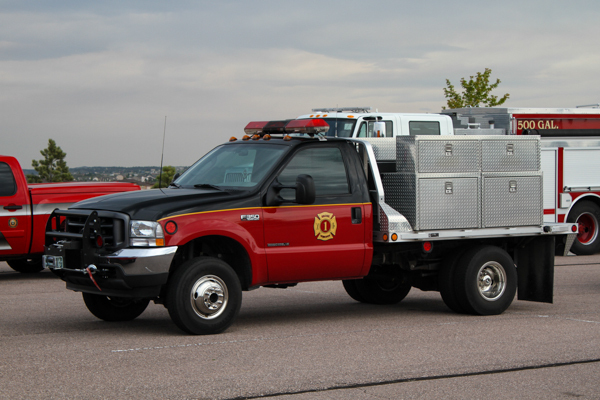 (Brush 1) Ford F-350 4×4 XL Super Duty. 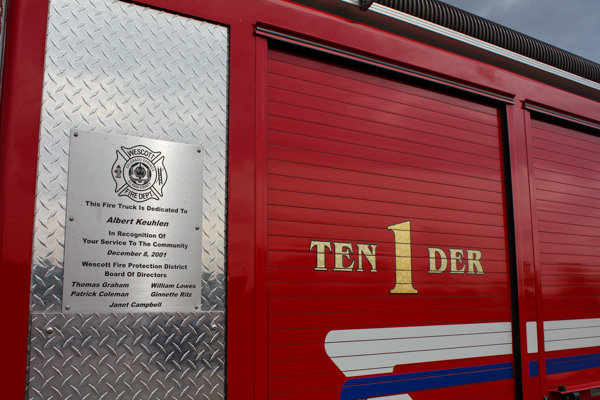 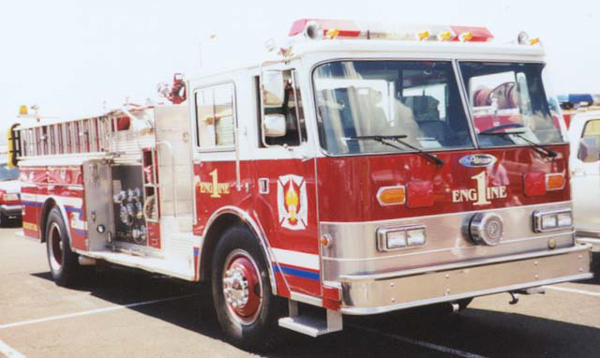 (Tender 1) Freightliner FL80 / American LaFrance, also ran as Tender 3. 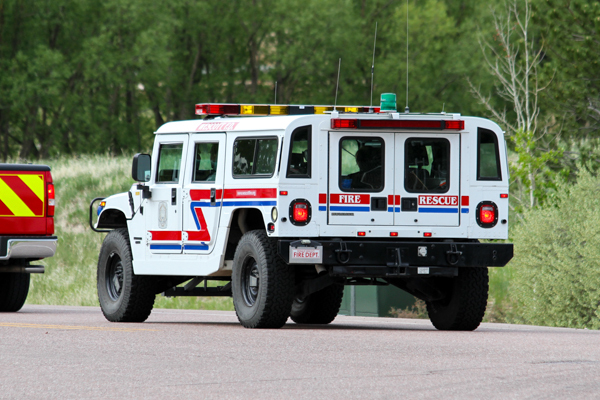 (Utility 1) Hummer, former Chief 1 and was originally painted white. 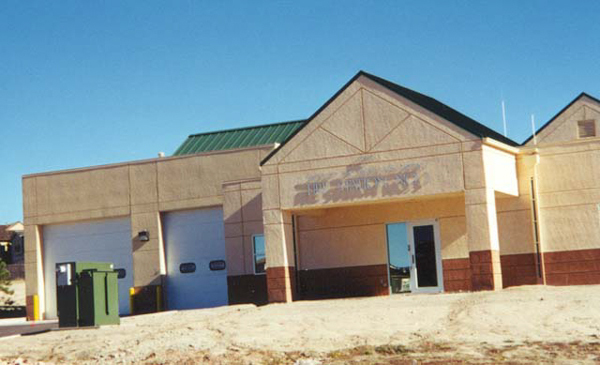 Fire Station 1 at the current located on Gleneagle Dr. shown here before the add bay. 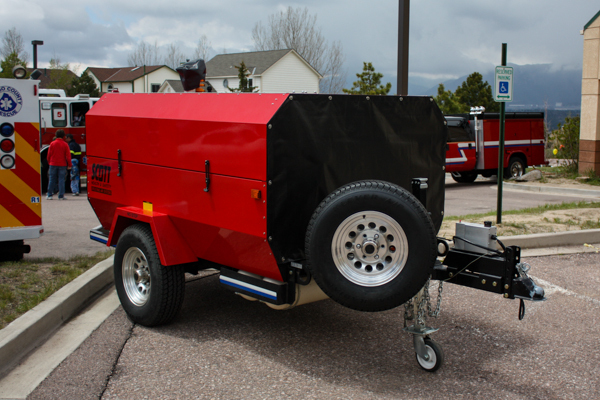 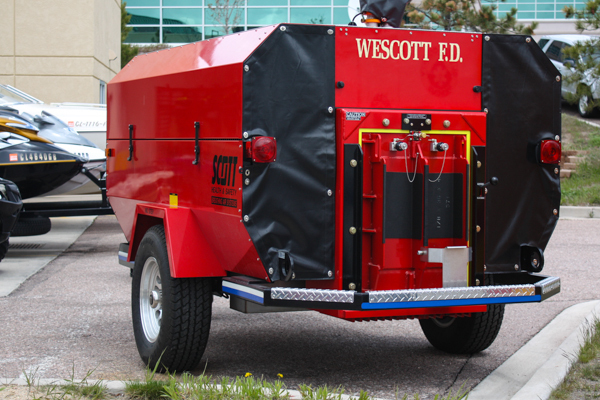 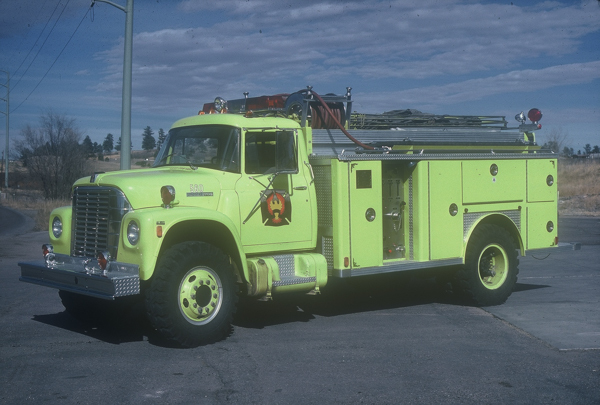 1975 International Loadstar 1700 / E-One (125) 750 gallon water tank / 250 gpm pump. 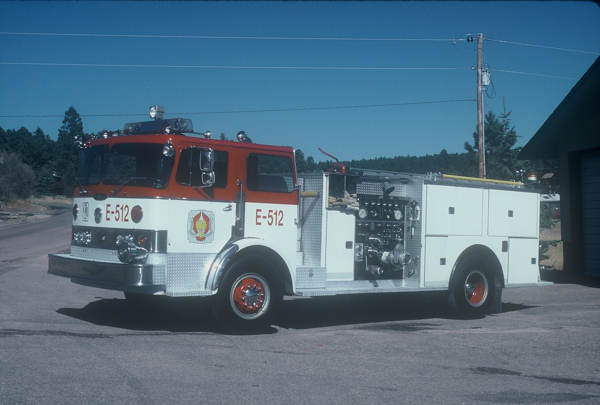 1978 Chevy C65 / E-One (623) 500 gallon water tank / 750 gpm pump, also ran as Engine 511. 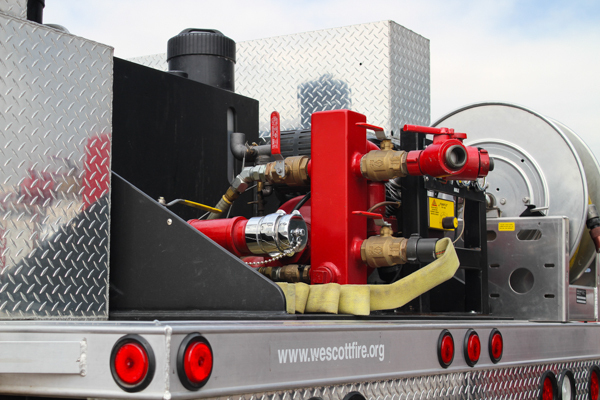 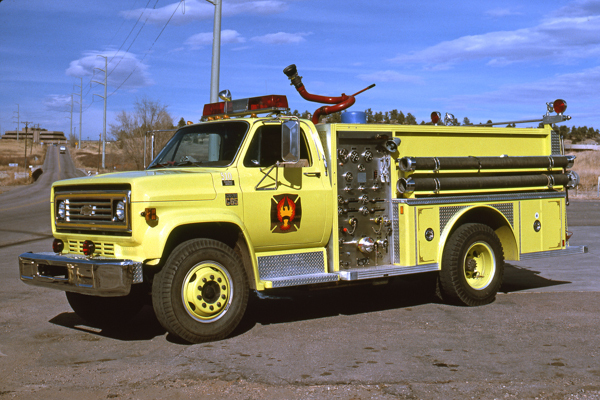 1978 Chevy C65 / E-One (623) 500 gallon water tank / 750 gpm pump. 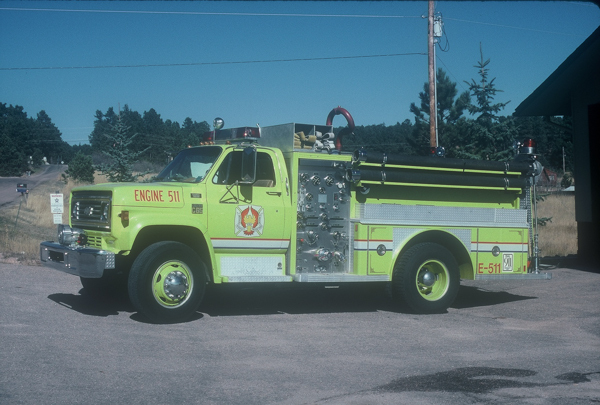 also ran as Engine 510. 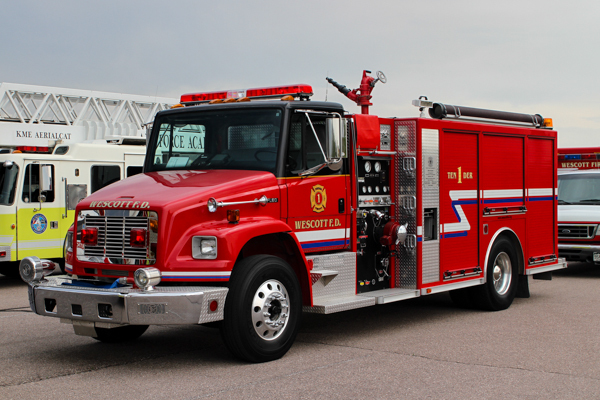 (Engine 1) Spartan Diamond / Rosenbauer / Central, currently running as Engine 511. 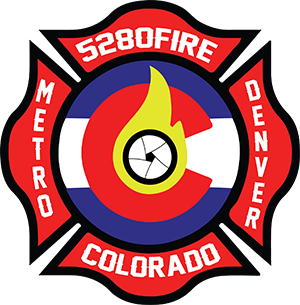 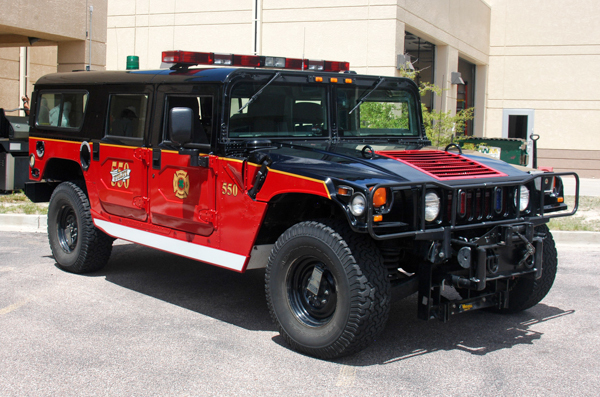 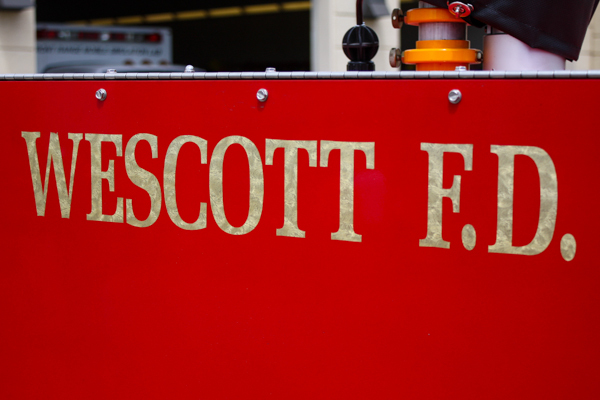 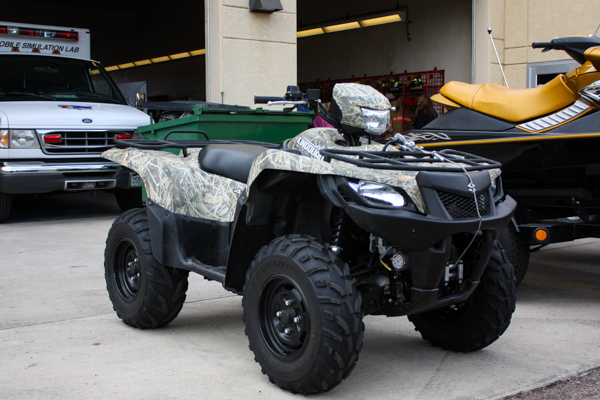 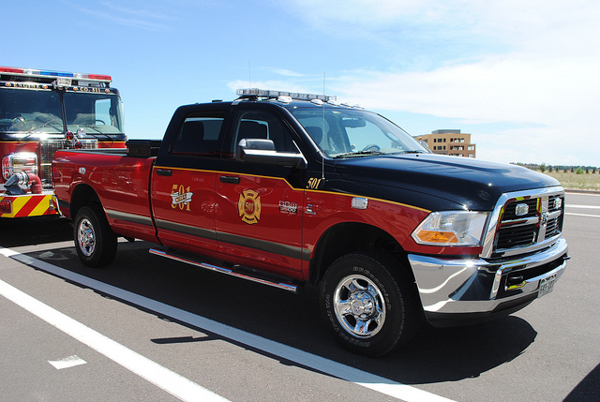 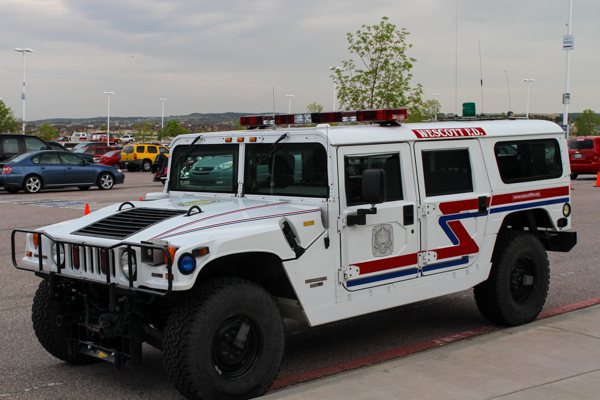 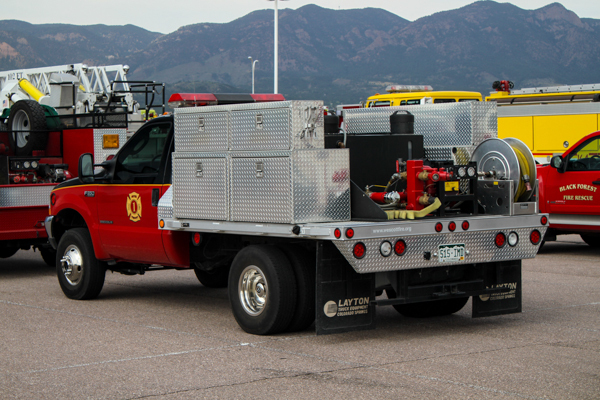 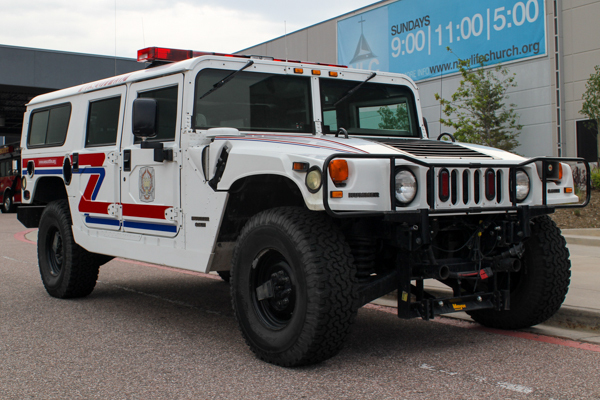 (AMR) Ford / AEV (ESA – El Paso County Emergency Services Agency). 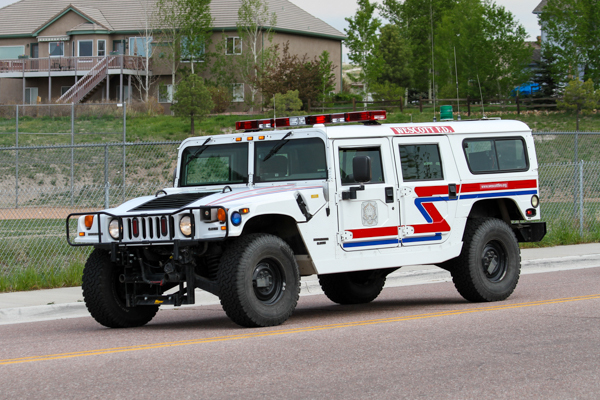 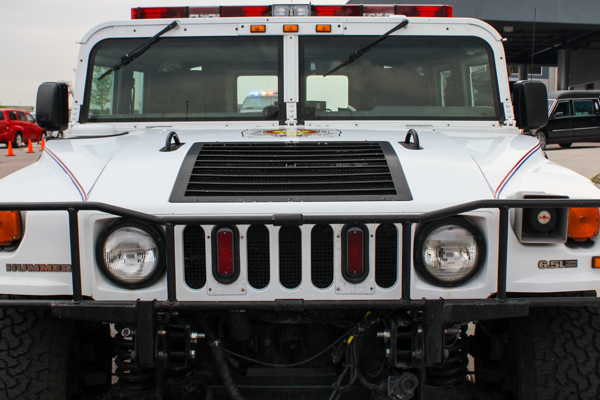 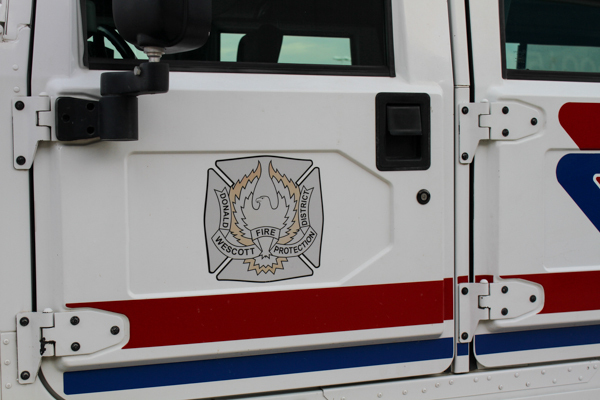 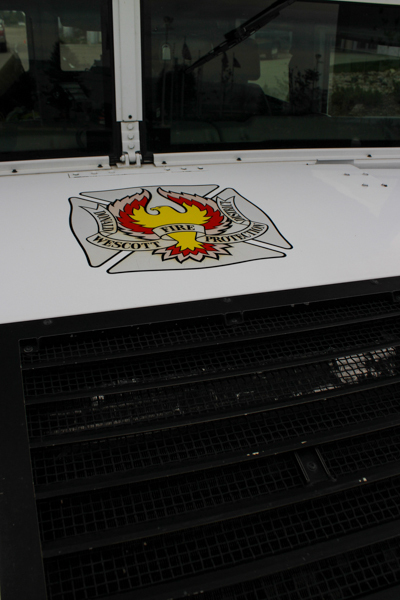 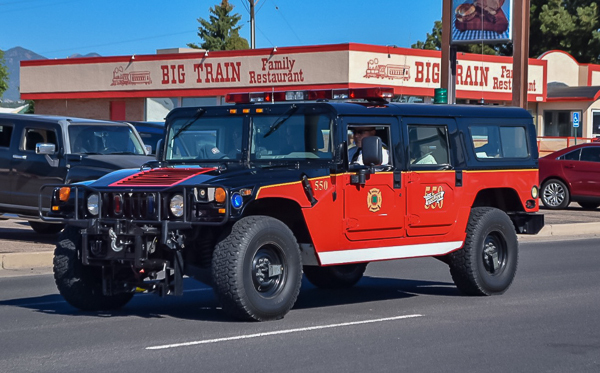 (Utility 1) Hummer, former Chief 1 and shown here painted white. 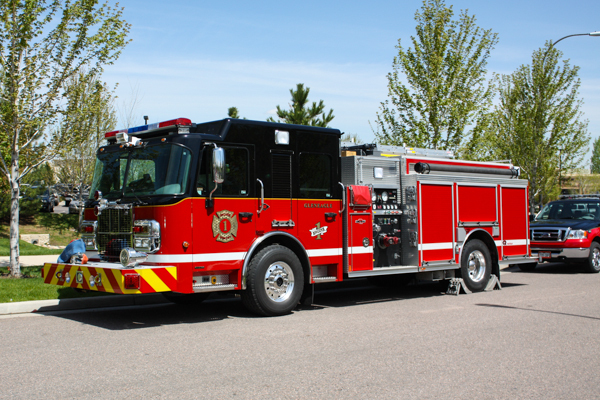 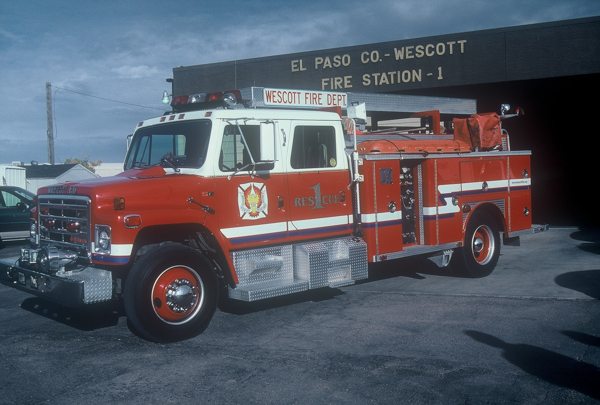 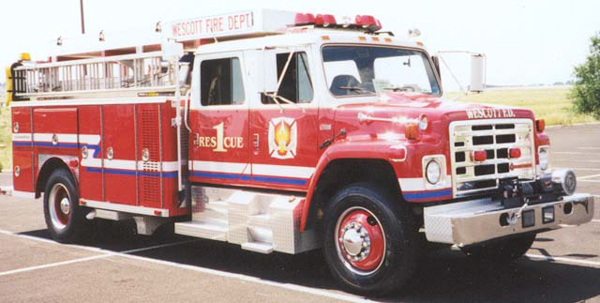 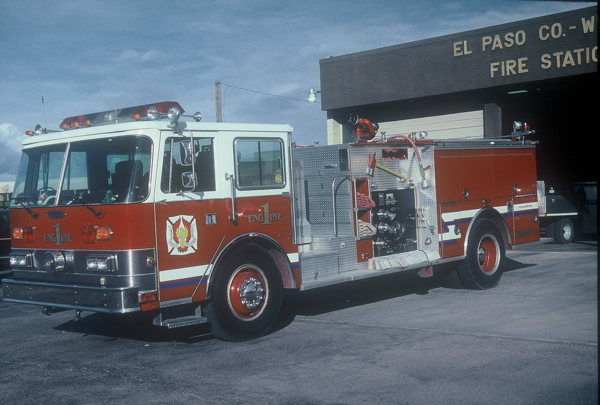 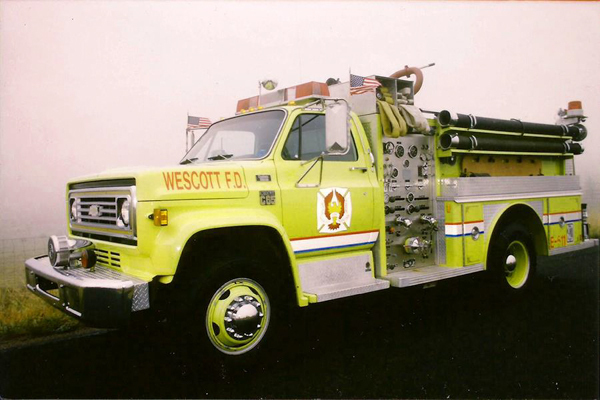 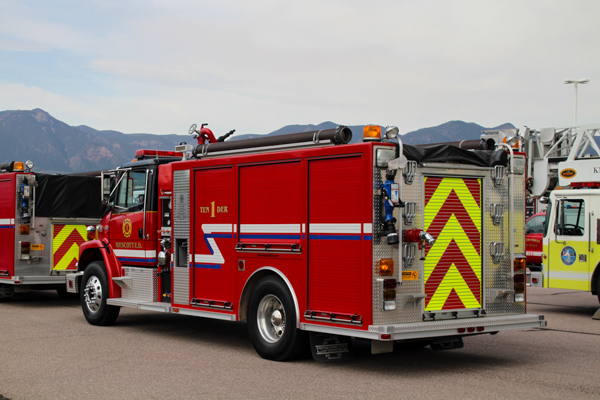 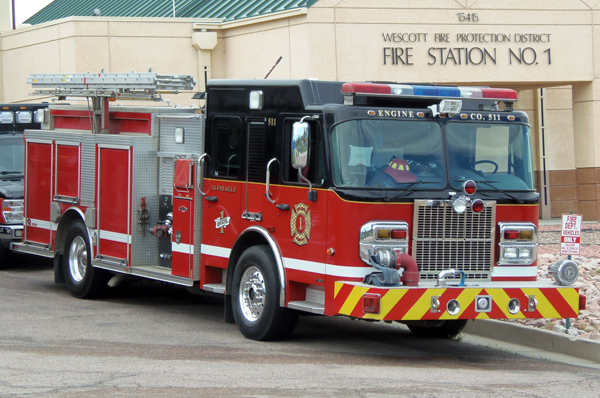 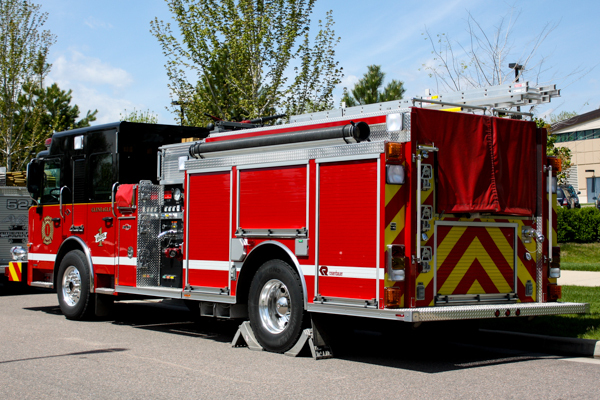 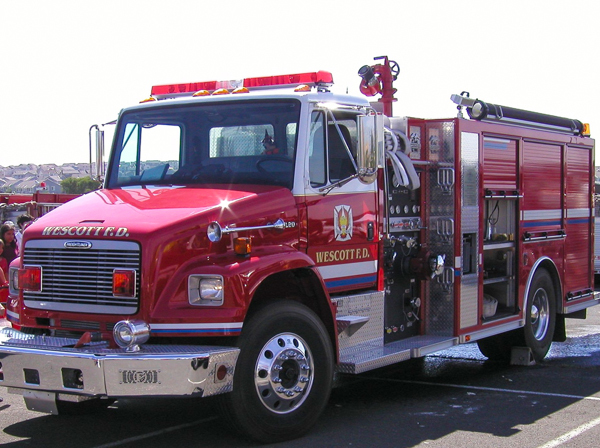 Freightliner FL80 / American LaFrance, shown here with the older paint and graphics, also ran as Tender 561.